The Incredible Hulk Returns (1988): This is the first of the Incredible Hulk made-for-TV movies that aired after the original television series was cancelled. I never liked the TV series, but the TV movies are incredibly interesting! What I like about the TV movies is that it broadens the scope of the Hulk saga. Dr. David Bruce Banner is actually on the verge of curing himself of the Hulk curse. Along the way, he meets the mighty Thor (played excellently by Eric Allan Kramer) and his human self Donald Blake (played by Steve Levitt). Donald Blake can actually transform himself into the powerhouse superhero Thor. 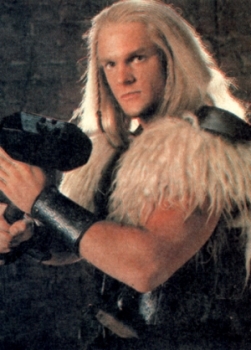 I know that the producers of this show wanted to spin-off Thor into his own series and I think it would've made a great show, but for some reason it just wasn't picked up. This movie was meant to be groundbreaking for the Hulk's ongoing saga and it is. Between the inclusion of popular superhero Thor and the fact that Banner was actually getting somewhere in curing himself of the Hulk's rages a new peak of excitement is added to the Hulk's story. What I really like about this show is that you don't have to be familiar with what happened in the TV series. This is its own production. And it was good enough to spawn two more made-for-TV movies!